Rooibos tea has in recent years caused a craze around the world for its exceptional healing properties and extraordinary medical benefit. If anyone is a competitor of green tea, it is the rooibos tea, which in addition to the abundance of minerals and vitamins does not contain caffeine, and thus it is all more sought after in Europe. Recently it can be found on local shelves and better equipped herbal pharmacies. What are the health benefits of rooibos tea and how is it dosed and used find out bellow. Although the red African bush has been cultivated for at least three hundred years, its revelation and popularity in the western world started in the sixties. Namely, in 1968 a young mother from South Africa - A.Theron was in great pains dealing with her baby, who suffered from serious allergies. Then with a lot of courage, she decided to try Aspalathus linearis rooibos and with the help of medical leaves of this plant, she successfully eliminated the allergies in her baby. After this experience, she decided to issue a publication on the treatment of allergies "amazing discovery" which has experienced a real boom and it immediately started the entire product lines of red African bush, from a variety of cosmetic products to medicines for allergies. As a real star among them the most popular product is rooibos tea that is still very much sought after. Parallel discoveries, headed by numerous scientific studies started because the entire scientific community became interested in it. The general conclusion is that the preparations of the African bush, especially red rooibos tea is very effective and useful for our health. 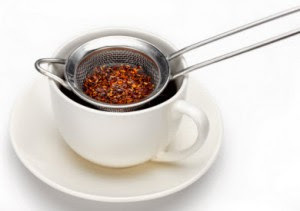 The remarkable healing properties of rooibos tea are due to the presence of antioxidants: notofangin and aspalatin. Red African bush is rich in minerals such as iron, calcium, copper, potassium, manganese, magnesium, zinc and phosphorus. It is excellent for immunity, it does not contain caffeine, and it is a real replacement for many popular energy drinks. Red rooibos tea stands shoulder to shoulder with green tea for its efficiency. As it has anti-mutagenic characteristics, this soothing tea prevents damage to our cells and their mutations, which can cause the most serious diseases such as malignant tumour. It is remarkable for the treatment of allergies, especially with food allergies, asthma, skin rashes and eczema and pollen allergies. It is recommended in the regulation of fats in the blood and triglycerides and it keeps hypoglycaemia under control, because of that it is recommended as a tea for diabetics. As we know rooibos tea strengthens the immune system, is an excellent adjunctive to therapy in the fight against viruses and bacteria, especially with the arrival of autumn and colder weather, when flues are raging. It successfully eliminates the anxiety and suffering relieved of accumulated stress. The African bush also slows the aging of the skin. As already mentioned rooibos tea in its composition does not contain caffeine, and therefore is suitable for everyone, including pregnant women, nursing mothers and small babies. It is fully safe to use. It can be used as a tea to relieve the symptoms of cramps that plague pregnant women and women after pregnancy. Nursing women are advised to use it because they will through breast milk transmit the effectiveness of this drink to babies. The tea should be drunk by children, namely in southern Africa against allergies, colic, stomach cramps and against nervousness. That is where the title "mother's miracle" comes from. In order for children to accept it without resentment, it is preferable to put little milk in cooled tea (slightly sweetened) to give it a better taste. The beverage will eliminate stomach pains and cramps, diarrhoea will stop and normal bowel movement will be established in babies. Rooibos bath for children works great with allergies, skin rashes and eczema. In addition to the recommended rooibos tea during pregnancy, it is desirable to tell your doctor about it and accept his/her advice. People with diabetes should certainly drink rooibos tea because it contains antioxidant -aspalatin line that will help the absorption of glucose, the secretion of insulin and reduce insulin resistance. In one word it will keep diabetes under control and will not allow abrupt jumps and falls of sugar in the blood. Hypoglycaemia can be very dangerous and this remarkable beverage does not allow it. One recent study from 2011 has proven that the red African bush reduces the dangers and risks of heart disease and many serious diseases thanks to polyphenols. Rooibos tea has a positive impact on the brain and slows the formation of senile dementia known as Alzheimer disease. This does not mean that elderly people have to drink it, it is desirable for young to take it as well, such as students because it will increase concentration, attention and cognitive abilities. Rooibos tea is an ideal replacement for coffee during the preparation of serious examinations, because you do not need to be be afraid to become caffeine-dependent because it will not cause caffeine dependency. This remarkable tea is an excellent tool for acne and pimples on face. We recommend to use rooibos tea in combination with other treatments. In African bush there are large amounts of zinc and afra hydroxyl acids, in addition to mitigating the inflammation of the skin, it will act as an antioxidant that is, it will prevent the formation of wrinkles on the face, mitigate acne and slow the aging of the skin. This acid has found wide application in many popular creams and cosmetics, so it is always better to get it at its natural resources and that is the red African bush, instead of giving a lot of money for cosmetic products. It can be used for the care of all skin types. The red rooibos tea is used externally by applying it on acne, sun spots or pimples. Besides being good for facial skin rooibos tea is very good for our bones. It acts as a preventative for osteoporosis, arthritis and back pain. It improves dental health and strengthens our fingernails. This extraordinary drink is very easy to prepare, it is necessary to pour one teaspoon of rooibos with 2.5 dl of boiling water and cover it. Leave it at least five minutes to rest, then remove the cover, filter and drink during the day. The dose of the tea is not necessary, because you can drink it instead of water if you like. Thus prepared tea will relieve stress and tension during the working day and at night because it will ensure easy and quiet sleep. The big advantage of this tea is that you can drink it without restriction, South Africans drink five or six cups of tea a day. Mix the tablespoon of rooibos with the same amount of fennel and pour a litre and a half of water over it. Cover it and leave for at least seven minutes to rest, then filter and drink throughout the day instead of water. Beverage made in this way has a soothing effect on infants which consume it through breast milk. Rooibos tea against allergy is prepared in the same as in the first recipe, provided that it needs a tablespoon of local honey and one tablespoon of apple vinegar. Drink 2 dl during the day. Pour a small teaspoon of rooibos, half a teaspoon of finely scrubbed ginger and a ¼ of a teaspoon of grated lemon peel, dried teaspoons of apple and a little black pepper and a litre of boiling water. Cover and hold there for a few minutes, filter and drink well throughout the day. You can add one teaspoon of local honey of your choice. As a great drink for weight loss with rooibos tea, sassy water proved efficient. IMPORTANT NOTE: Although this drink does not cause side effects and adverse reactions, generally rooibos tea is not recommended for liver disease and kidney disease. Rooibos tea; where to buy it? You will find it only in well-equipped specialized shops and herbal pharmacies in major cities in the region, although things are improving and is commercially available in other major centres. Recently it can be ordered online, a mitigating factor in any case, but pay attention to what you are buying and always count on the fact that you will be the one to pay for the shipping. We are not big fans of tea bags, so it is advisable to get it in bulk. Rooibos tea that we have found has a price of 5-6 dollars for a pack of 50 grams (20 filter bags), but it has been stated that soon you would be able to choose the amount you want to buy. We suggest that you previously and additionally get informed about the manufacturer, make sure they have a certificate, read experiences on forums and similar. Freely share with us your experiences in the comments.